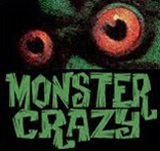 “Tells the great story as Mary Shelley wrote it…” Well, not quite. 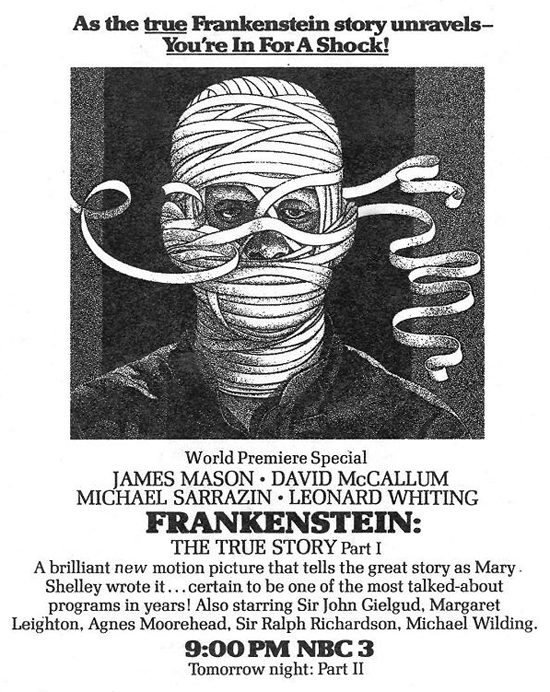 In fact, Frankenstein: The True Story (1973), as written by Don Bachardy and Christopher Isherwood, was one of the most innovative and over-the-top re-imagining of the story ever filmed, owing more to Hammer Films’ Frankenstein series — including the services of makeup man Roy Ashton and the stages of Pinewood Studios — than anything Mary ever wrote. The ad copy may be all wrong, but the beautiful stippled artwork, artist unknown, is perfect. 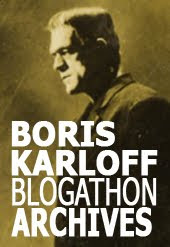 Michael Sarrazin played the decaying monster in this TV movie, but the unraveling bandages in the illustration show eyes and a nose that obviously belong to Boris Karloff. I to am a student and found the story very disturbing yet interesting. After reading the story I wonder if Mary could have made the creation a little more caring. I also found his upbringing very interesting. The whole relationship with Elizabeth and how he longed for a companion was quiet interesting? I wonder could Mary have been suggesting that his longing for a companion was in reference to him being gay. This story brought up many questions in my head. Although interesting I found this story way to dark for me I am more of a romantic I would have loved for Frankenstein to have fallen in love with his creature or Elizabeth.